Constant exposure to screen violence can profoundly affect both children and adults in two important ways: we can come to need a daily dose of violent media, and we can build an immunity to violent imagery, becoming incapable of producing socially acceptable emotional responses. As our kids desire increased levels of violence and become more and more desensitized, they are constantly learning that harming is fun, "natural," and the "right" thing to do. To make humans continue doing something naturally repulsive, you make it fun for them. This is called classical conditioning. The Japanese army very effectively used classical conditioning with their soldiers. Early in World War II, Chinese prisoners were placed on their knees in a ditch with their hands bound behind them. And one by one, young, unbloodied Japanese soldiers had to go into the ditch and bayonet "their" prisoners to death. This is a brutal, horrific way to have to kill another human being. Up on the banks, their friends would cheer them on in their initiation to violence. Afterward, they were treated to the best meal they'd had in months, sake, and "comfort girls." The result? They were not just desensitized to violence; they were taught to enjoy violence, to associate human death and suffering with pleasure. This technique is so morally reprehensible that there are very few examples of it in modern U.S. military training. Yet every day children of all ages and in all stages of brain and ego development watch vivid pictures of human suffering and death for fun and come to associate horror with their favorite soft drink, candy, girlfriend's perfume, birthday party celebrations, or comfort in the hospital bed. "It's your birthday. 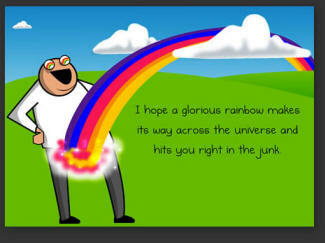 I hope a glorious rainbow makes its way across the universe and hits you right in the junk." 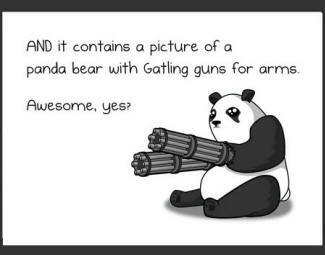 "Instead of just saying "Happy Birthday" on Facebook like everyone else, I thought I'd get you an actual greeting card AND it contains a picture of a panda bear with Gatling guns for arms. Awesome, yes?" "It's your birthday! 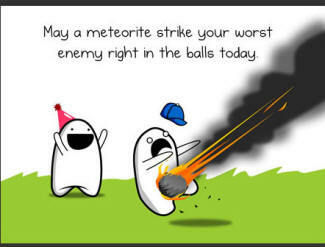 May a meteorite strike your worst enemy right in the balls today." "It's your birthday! I hope an angry badger mauls your worst enemy right in the privates today." "Hanging out with you is like riding a dolphin into outer space. Exhilarating, inspiring, and it often results in exploded mammals. Happy birthday."